If you visit Boston Prep, you will hear these words many times a day. You will see them on the walls. Each week, the entire school community comes together at community meeting for the presentation of the DuBois Award, an award presented to a student who is living fully into Boston Prep's virtues, courage, compassion, integrity, perseverance, and respect. After the DuBois Award has been presented, every member of the school community holds hands and together shouts, "Effort determines success." What does this key Boston Prep motto really mean? Why are these three words repeated over and over as a refrain? 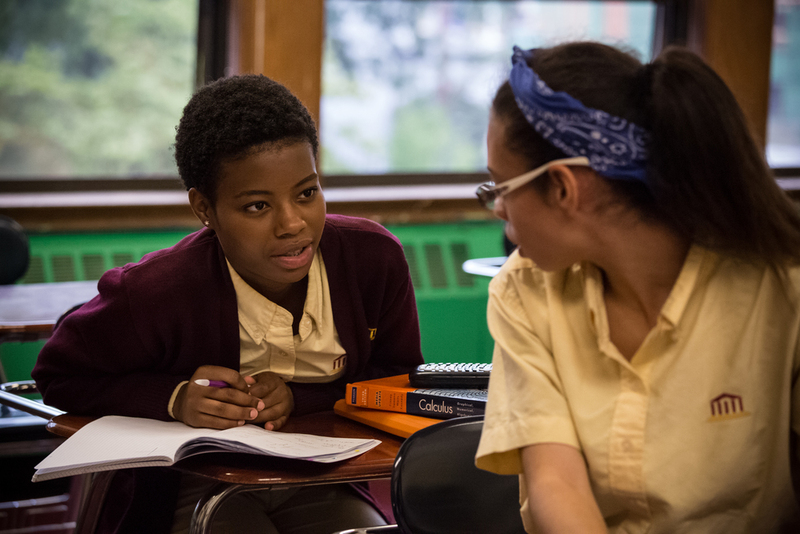 At Boston Prep, we believe firmly that all students can achieve at the highest levels. It is not one's innate ability, luck, zip code, or family background that dictates one's potential. Instead, it is effort. When given an equal opportunity, all students can succeed with determination and hard work. Effort determines success. We have seen this borne out again and again at Boston Prep. Boston Prep serves students in grades six through twelve from throughout the city of Boston, selected by lottery. Nearly all, 97%, of Boston Prep's students are students of color. 75% come from low-income families, qualifying for free or reduced price lunch. Almost half (46%) of Boston Prep's students come from Dorchester, Mattapan, and Roxbury, Boston's most underserved neighborhoods. Statistically, our students would not be expected to accomplish much beyond high school. If they did choose to enroll in college (statistically, only half of our graduates would), very few would finish. A Pell Institute study found that only 10.9% of low-income, first generation college students, as many Boston Prep students are, obtained a four-year college degree within six years. However, at Boston Prep, the outlook for our students is much brighter. Boston Prep's record of success begins with our middle and high school program. Boston Prep students consistently outperform their peers across the city of Boston and the state of Massachusetts. This past week, 2015 MCAS scores were released. Once again, Boston Prep tenth grade students outperformed their peers in Boston Public Schools and across the state on the English Language Arts, Math, and Science exams. Values indicate the percent of students scoring in the Advanced or Proficient categories. Note: Middle school students did not participate in the 2015 MCAS exams but instead piloted the PARCC exams, for which scores are not yet available. As students advance, they continue to prove that national trends need not be continue to hold true. Over the past five years, 100% of Boston Prep graduates have been accepted to four-year colleges and have enrolled in college the semester following graduation. 85% continue to persist in college today, on track to earn their degree, over four times the national six-year college graduation rate for African American and Hispanic youth. As these outcomes demonstrate, success need not be dictated by one's zip code or family background. All students have the potential to achieve at the highest levels. When given high expectations, students will meet them. When given equal access to high quality education, students will succeed. At Boston Prep, we have carefully and deliberately designed our programs to ensure every student has the opportunity to succeed. We begin with integrated programs across middle school, high school, and college. Programming is vertically aligned from 6th grade through college graduation. In our extended time with students, we focus on both academic excellence and ethical growth. Academically, our classes are defined by high expectations, Common Core aligned instruction delivered with urgency, and engaging lessons. Students benefit from extended learning time through an extended school day and an extended school year. Students can access robust supports both in and out of the classroom, including Saturday Academy, office hours, and tutoring support, to ensure all students have the supports necessary to excel. All of our work with students is built upon a foundation of ethical development. We develop a common language grounded in our virtues and help students develop a sense of morals and values, developing a framework for decision making and how to treat themselves and others throughout life. Paired with our belief that all students can achieve at the highest level is an understanding that students learn in different ways and at different rates. Challenges will arise. As such, we offer robust supports both in and out of the classroom to provide students the resources necessary to achieve success. None of our work would be possible without our excellent teaching and leadership staff. Knowing that teachers and school leaders are the factor that has the greatest impact on student success, we invest deeply in recruiting, developing, and retaining the best teachers. As a whole, research by CREDO at Standford University has found that Boston's charter schools are the top performing charter schools in the country. However, the number of students who can access the high quality educational opportunities offered by Boston's charter schools is limited. The charter school cap dictates what percent of a district's revenue can be allocated to charter schools. In Boston, the charter school cap has been reached. As a result, Boston Prep and other high performing charter schools in Boston are unable to expand to reach more students. Thousands of students remain on waiting lists, waiting for a seat to open up at a school with a proven track record of success. Governor Baker has declared his support for lifting the charter school cap. At a recent rally at the State House, Gov. Baker stated, "My view on this is really simple. I don't really care how the cap gets lifted. I just want the cap to be lifted." Furthermore, "the fact that we have 37,000 kids on a waiting list to get into a school of their dreams here in the Commonwealth is a disgrace. We have a great opportunity to do something about that." At Boston Prep, we believe every student, regardless of zip code or family background, deserves an equal opportunity. High quality education is a right, not a privilege. Because when children are given the chance, they can rise to amazing heights.